MISSION BAY — Volunteers aboard boats and kayaks, and on land participated in a project to clean up Mission Bay Oct. 27, making the inaugural “Mission Possible: Clean the Bay Day” event organized by SeaWorld and San Diego Coastkeeper a success. More than 140 volunteers arrived at Marie Starns Park (formerly South Shores Park) for the event, removing more than 433 pounds of trash from the bay water and on shore. Participants scanned the water aboard boats and kayaks, and many more scoured the shoreline for trash — finding a wide array of discarded or lost items, including a DVD, an engine pump, a can of foam cleaner and a street sign. 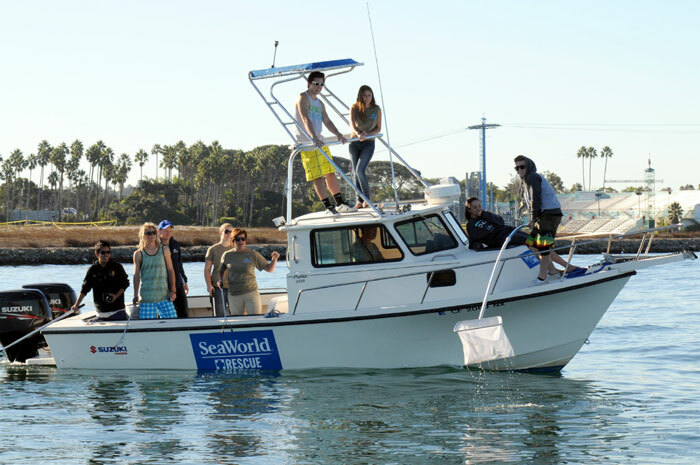 Boaters aboard two pleasureboats helped out during the cleaning event, and they were joined by volunteers in San Diego Coastkeeper’s 19-foot Boston Whaler and two SeaWorld vessels. Three kayaks full of volunteers also assisted in the waterside cleanup. While Coastkeeper regularly holds cleanup events in the Mission Bay area, this was the first time the environmental group had teamed up with SeaWorld. Watson said she hopes the cleanup will spark more involvement between Coastkeeper and the recreational boating community in Mission Bay and San Diego, and the group has plans to turn the cleanup day into an annual event. A high school teacher at El Cajon Valley High School, Bethe said she was pleased to see the large number of youth participants in the cleanup. Since January, volunteers with San Diego Coastkeeper have removed 740 pounds of debris from beaches on Mission Bay and nearby Mission Beach, the organization reported. Most of these are buoyant items — including plastic foam and plastic particles, bags, wrappers and straws — which can impair water quality and degrade coastal habitats, and also harm wildlife through entanglement or ingestion.